The Skinny: Gordon Chan directed this UFO-like drama that features one of most bizarre collection of actors EVER. A well-meaning but also trite and uninteresting drama. Though it isn't a film by UFO, it might as well be. This urban drama-comedy from director Gordon Chan and writer Chan Hing-Kai tells the tale of four old friends and the arrested adolescence that threatens to destroy the fabric of the universe. Or something like that. 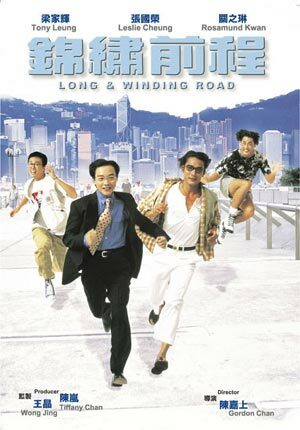 Leslie Cheung is the main guy, a total scumbag who chooses to betray buddies Michael Wong, Dayo Wong and Tony Leung Ka-Fai for bucks and the attentions of Rosamund Kwan. Even worse, he steals Rosamund from ultra-nice guy Tony Leung, which only lowers his standing on the sympathy meter. Thankfully, he loses all his friends on his trip up the corporate ladder, but the expected will occur. Leslie will do a complete reversal and seek absolvement for his terrible, terrible ways. Hopefully you'll still be awake.